The chapter starts with Rukia, Chad and Renji. The he goes to attack the three of them but suddenly they can all feel a huge reiatsu. 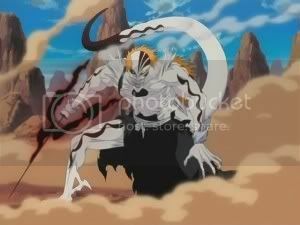 We see Ulquiorra who still has his head, right side and lower half intact. Ichigo tosses him away but then walks towards him intent on chopping up what is left. Ichigo faces Ishida and then draws his sword before stabbing Ishida in the abdomen. While Orihime is walking towards Ishida she can hear Ichigo talking. “He..help…I will help.” Ichigo mutters as if it’s a mantra. Orihime is astonished (it’s like she is disappointed in herself because she came here to help and then just ended up relying on Kurosaki kun again). She says “stop it Kurosaki kun” but Ichigo just moves towards Ishida. He is about to kill him with a cero from his horns however Ulquiorra who was meant to be dead helps Ishida by cutting off one of Ichigo’s horns and folding the other (Ulquiorra’s body is fixing itself little by little). It ends with a big explosion over Ichigo’s head. 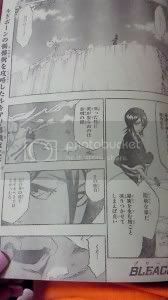 sidetext: The last attack (the spoiler writer commented that maybe it means Ulquiorra used the last of his power to save Ishida, though this is just speculation). The title is the Lust 6. Trivia : Ichigo has been noted on several occasions to have tremendously vast levels of spiritual energy, even by captain-level Shinigami standards. It is so overwhelming that even when worn-out in battle, he can continue fighting effectively while still capable of unleashing Getsuga Tensha. Fourth Espada Ulquiorra Schiffer has claimed that Ichigo’s spiritual power at its peak is even greater than his own, but that it fluctuates wildly when he is in conflict with his inner hollow. Due to the fact that he has far more spiritual energy than his body can contain, it leaks out constantly, preventing him from hiding it and effectively making stealth impossible when dealing with other spiritually-aware creatures. However, he has learned how to harden his spiritual energy and enhance the strength of his attacks or act as a barrier to reduce the impact of attacks on him, if not block them completely. Even before this, his spiritual energy was so great he was able to withstand a Menos Gillian-class Cero and subsequently wound the same Gillian, forcing it back into Hueco Mundo while using only his sealed Zanpakuto. If you would like to discuss the spoilers or predictions, please leave a comment below.